In a hurry? Pin it here for later! Have you ever wondered about when you should divide your garden plants? Dividing perennial plants is an important, DIY fall garden maintenance task. With this short DIY segment, we aim to teach you about dividing your perennial plants in an easy, efficient way. By the end of this short "DIY Garden Minute," you will learn what it means to divide plants and which plants would be best to divide this fall. 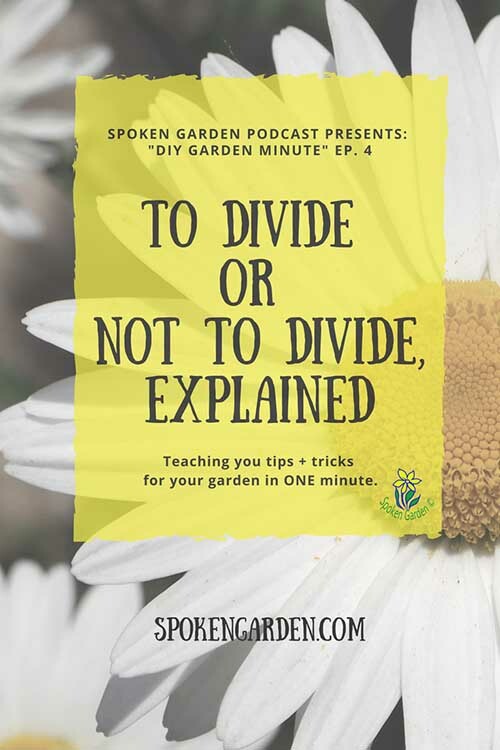 And hey— before you head out—if you want to connect with us and subscribe to our newsletter go to Spoken Garden's free resource page! We have FREE content we are so excited to give to you! See you there! Have you ever wondered about when you should divide your perennial garden plants? Dividing is a fall garden maintenance task. What dividing your plants means? When should you divide your plants? Examples of plants that can be divided.